Richard is the percussionist in the acoustic Latin power trio Más Y Más and creator of Yeti Boy Records. Specialising in Afro-Cuban percussion his main instrument is the Conga Drum (Tumbadora) but he also plays Cajon, Bata Drums and Bodhrán as well as many other hand held percussion instruments from around the world. Richard first took to the drums during his early life living on the island of St Lucia in The Caribbean. Since then he has gone on to study Afro Cuban drumming in the UK and on many occasions in Cuba, since his first visit in 2002. He has studied with bands such as Clave Y Guaguanco, Afro Cuba de Matanzas, El Septeto Nacionál De Ignacio Piñero and La Orquesta Sublime. He has also studied intensively with Santiago Garzon Rill ‘Chaguito’ during every visit to Cuba. Chaguito has become Richard’s mentor over the years and this relationship was at the heart of the collaboration that saw Más Y Más travelling to Havana where they recorded their third album ‘La Bala’. Richard also plays alongside Simon Bowhill and Dave Boston in The Axis Percussion Trio, dedicated to the playing, study and promotion of Afro Cuban percussion. He is a committed educator having worked for over 12 years in a great variety of educational settings with a number of his pupils having followed in his footsteps to Cuba. 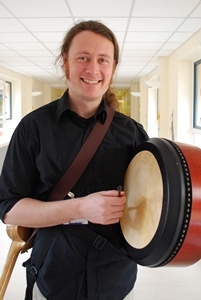 Since 2009 Richard has also been working more intensively with music in health care settings through OPUS, specialists in music and health. Richard has played with Rikki Thomas-Martinez and Wayne D. Evans in Más Y Más since 1998 playing on every gig and album with the band since then. He has toured extensively round Europe and the far-east with his favourite gig to date being to 20,000 people in the Rainforest in Sarawak, Borneo. Richard has also played and recorded with Rich and Famous, The Last Pedestrians, Muha, Shmoov, Bass Tone Slap, Orquesta Timbala and is featured on two albums by Zoë Johnston.